By 1609, famed English explorer Henry Hudson had already failed twice in his search for a northern water passage to Asia. Undaunted by defeat, Hudson capitalized on his widespread reputation as an expert navigator and secured the backing of the Dutch East India Company for another attempt. With a crew of twenty, in March of 1609 he set sail from Amsterdam, Holland in the Half Moon, a splendidly outfitted ship of 80 tons. Initially taking the northeast route of his earlier expeditions, in the face of constant head winds, fog and ice, Hudson abandoned the effort and decided on a westerly course. In September of 1609, while searching for a nonexistent water route through northern Canada, Hudson entered the silvery, 850-mile long river in New York that today bears his name. The following year he returned with a crew of twenty-five men in the English ship Discovery and sailed into what is now called Hudson Bay, exploring the east coast as far south as James Bay. After two icebound winters, his crew grew mutinous from a shortage of food and set Hudson adrift, along with his son and seven other sick crew members. The ship returned to England where the mutineers were tried for their crime but found not guilty. Nothing was ever heard of Hudson again. News of Hudson's discoveries spread throughout Europe, and soon colonists began to arrive from both Holland and England. A village grew up on the river 28 miles south of Albany, and by 1785 the town was anointed with the name Hudson. One hundred and fifty years later, in 1935, the city fathers of Hudson, New York sought to commemorate the sesquicentennial of the town's founding. 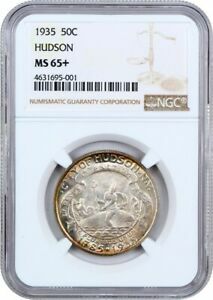 Following the increasingly popular practice of issuing a commemorative coin to mark such an occasion, the Hudson Sesquicentennial Committee's plans for a half dollar encountered little opposition from a U.S. Congress that seemingly rubber- stamped almost every commemorative coinage proposal of the day. 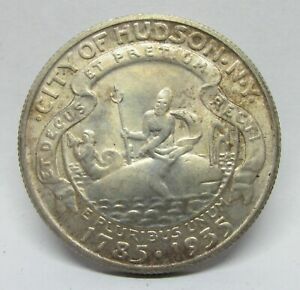 Congress passed a bill authorizing the minting of 10,000 Hudson Sesquicentennial halves (as well as 50,000 Rhode Island Tercentenary halves), and it was signed into law by President Roosevelt on May 2, 1935. The federal Fine Arts Commission recommended several distinguished artists to execute the design. Hudson Mayor Frank Wise preferred John Flanagan, designer of the Washington quarter, but prominent sculptor-medallist Chester Beach was finally chosen to prepare the sketches and models. 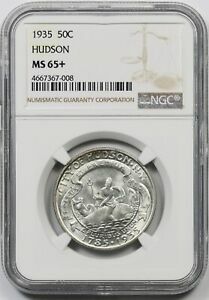 Although the Sesquicentennial Committee initially favored a portrait of Henry Hudson on the coin's obverse, Beach prepared several different proposals, one featuring Hudson's Half Moon in place of the portrait, and this motif was ultimately approved. The design as adopted displays dual nautical themes. 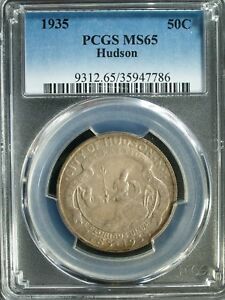 The obverse depicts the Half Moon with billowing sails and the word HUDSON in the waves below. The inscription UNITED STATES OF AMERICA arcs above at the rim, with the motto IN GOD WE TRUST just below. At the lower border is the denomination HALF DOLLAR. A curious addition to the obverse was a crescent moon in the upper left field. From Beach's original correspondence concerning the obverse design, apparently the artist was unaware of the difference between a quarter moon and a half moon, as he called the intended symbol the latter, which it clearly is not. Beach's monogram CB is seen on the left side of the obverse just above the waves. 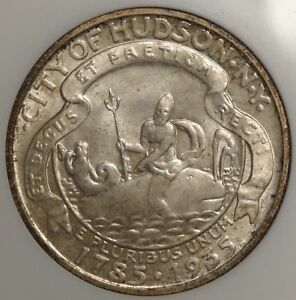 The reverse reproduces the city seal of Hudson. Neptune is seen riding a whale, seated backwards, while in the background is a mermaid blowing a conch shell. This rather whimsical design is framed by a large scroll that contains the city motto: ET DECUS ET PRETIUM RECTI - "Both the honor and reward of the righteous." 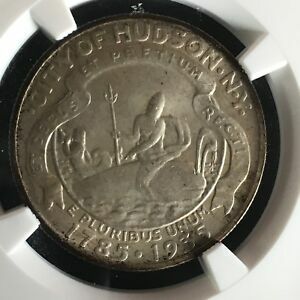 Below the seal is the motto E PLURIBUS UNUM, and encircling the border is the inscription CITY OF HUDSON NY and the dual dates 1785-1935. 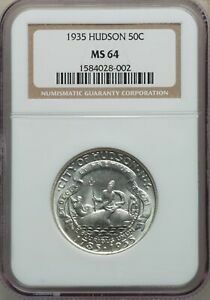 The Philadelphia Mint struck the authorized maximum of 10,000 coins (along with eight reserved for assay), and distribution was handled by the First National Bank and Trust Company of Hudson. Few collectors, however, were able to obtain specimens at the issue price of $1 each. 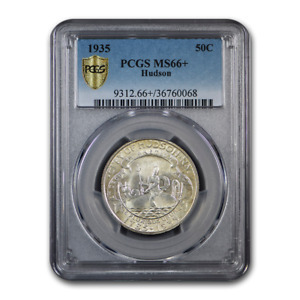 Although the coins were received from the Mint on June 28, by July 2 the entire mintage was supposedly sold out. The official line was that orders for the coins had been taken since early May, though few collectors could have been aware of the coins' pending debut so soon after the authorizing act. 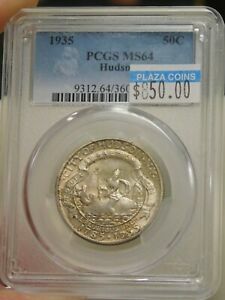 Allegedly, New York coin dealer Julius Guttag purchased 7,500 coins for 95 cents apiece, and Hubert Carcaba of St. Augustine, Florida bought another 1,000 pieces. 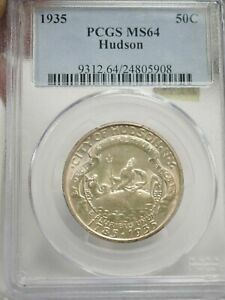 A month after the first coins were distributed, they had reached a peak of $12.50 on the secondary market, the highest price that Hudsons would reach until after the Second World War. Several months later, individual pieces settled into the $4.50 to $7.00 price range, and they saw wide distribution at that level. 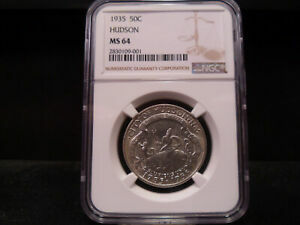 The majority of Hudsons were sold to coin collectors, and as a result most survive today in mint state. High grade specimens, however, are very scarce, as handling and bag marks prevent the bulk of the surviving population from grading higher than MS-64. Most Hudsons have a soft, frosted finish, while a few will show a brilliant, frosted appearance. Because of the exposed, smooth surfaces on each side, the Hudson is particularly susceptible to abrasions. Wear will first appear on the ship's sails on the obverse, and on the whale and Neptune on the reverse. Striking details are seldom complete, and few coins exhibit full definition on the ship's rigging. 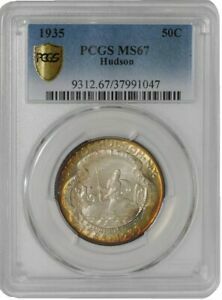 Although proof commemorative coins are infrequently seen and often controversial, two matte proof strikings of the Hudson have been reported over the years, one piece allegedly from the estate of Mint Engraver John Sinnock. Imitations of the proofing process have been made by acid-treating regular business strikes. 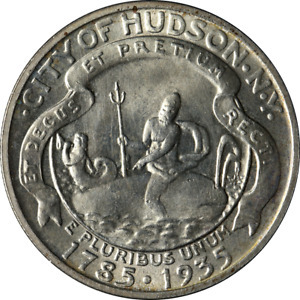 In addition, several counterfeits of the Hudson exist: One shows tooling marks in the fields around MERI and the city motto, while the other has a small depression on the second A in AMERICA and retooling on Neptune's face. In a hearing before the Senate Committee on Banking and Currency in March of 1936, American Numismatic Association Legislative Committee Chairman L.W. Hoffecker addressed the difficulty experienced by collectors desiring to buy the coins at the issue price. Hoffecker testified that he believed a single coin dealer had purchased the majority of the mintage at a discounted rate. 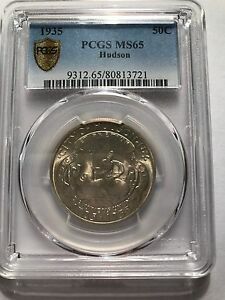 While he declined to publicly name the party in question, insiders at the time were slyly referring to the Hudson coins as "Guttag half dollars." Even today, there are well-founded rumors that as many as a thousand coins may still exist in the estates of some families in the Hudson River Valley. As recently as 1982, one family was known to still own eight original rolls. Although there is little chance that these 160 coins will be dispersed anytime soon, their eventual release is unlikely to result in any significant increase in the availability of gem examples. 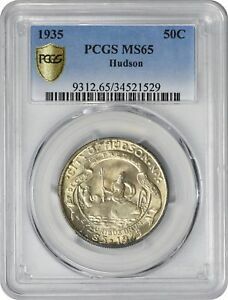 In spite of the criticism that the Hudson received when issued, its initial distribution "problems" have been long forgotten by the vast majority of collectors. 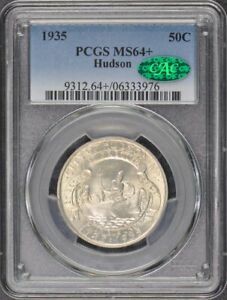 Today, the Hudson half dollar enjoys wide respect as one of the key condition rarities in the commemorative series.